For many teenage boys, turning 18 marks the moment they become a man. For Max Verstappen, that moment arguably arrived six months earlier. Despite his slender frame, many knew before the then 17-year-old strapped himself into his Toro Rosso for the opening race of the season in Australia that the Dutchman was a special talent. Just how much of a special talent, though, has arguably surpassed all expectations. Verstappen's fanbase has increased as the season has gone, with the youngster consistently wowing spectators with his aggressive and daring driving style. In Monaco, with Sebastian Vettel running third and arriving to lap backmarkers, Verstappen - also a lap behind Vettel - 'hid' behind the Ferrari and passed his rivals as they moved out of the way of the former world champion. His move at the Belgian Grand Prix in August, when he swept around the outside of Felipe Nasr at Blanchimont at speeds of more than 185mph, left BBC commentator Allan McNish in awe. "That was big," he said. "It is the first time I have ever seen someone go around the outside of someone at Blanchimont in my life." Only in October, with 14 grands prix under his belt, was Verstappen legally able to drive on public roads. On his 18th birthday, he took his driving test and promptly passed - it would take a brave instructor to fail someone who had been taking F1 by storm for months. Since then, he has simply gone from strength to strength. His overtaking moves on Sergio Perez and Nasr lit up an otherwise dull Brazilian Grand Prix in the season's penultimate race and now the paddock talk is about which of the front-running teams will make their move to sign him up in the near future. 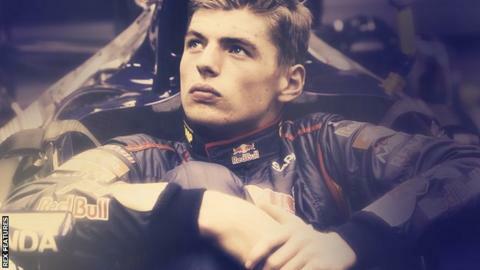 "I have compared him to Michael Schumacher and Ayrton Senna," said BBC F1 analyst Eddie Jordan recently. "I feel at this stage of his career he is that good." In F1, there's no higher praise than that.